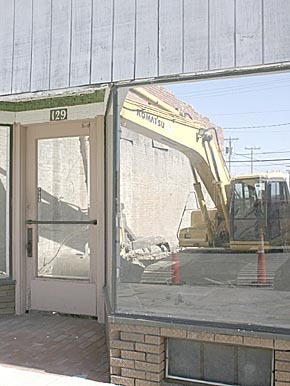 A large excavator from Bygland Dirt Contracting, Inc. made quick work last week of removing the building that once housed a Gambles Store and later the Family Hair Care Center in downtown Albion. It has been vacant for about five years. The building front was left in place to avoid possible damage to neighboring buildings in taking it down. The basement has now been backfilled, and the lot stands ready for a possible new commercial building in the future. Albion Economic Development Corp. assisted with the project.